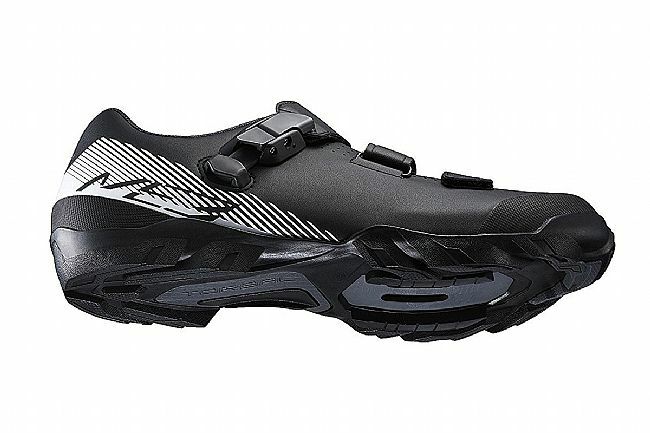 The Shimano SH-ME3 MTB Shoe is a versatile shoe designed to perform flawlessly on intense off-road rides. The ME3's feature a comfortable synthetic upper complete with low-profile reverse buckles and a cross X-strap to provide a supportive, adjustable fit designed to eliminate hotspots. Featuring a lightweight construction and efficient design, these shoes offer a TORBAL midsole rigid enough for responsive stability, yet flexible enough for a more natural feel and flow on descents. Complementing the flexible stiffness of the glass fiber-reinforced TORBAL sole, the ME3 utilizes a lightweight rubber outsole to deliver all-condition traction for performance on or off the bike. 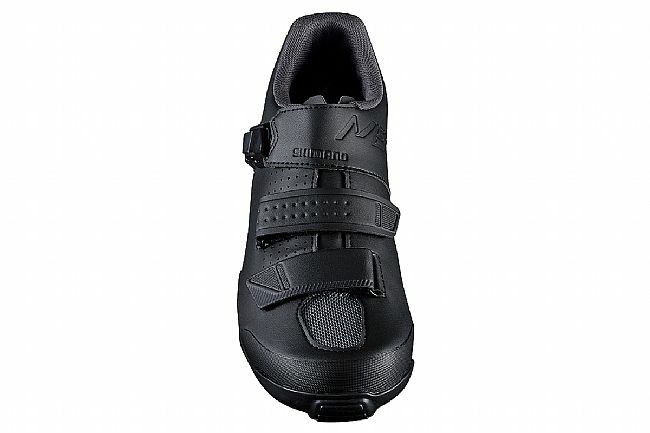 The Shimano SH-ME3 MTB Shoe is compatible with 2-bolt cleats. Also available in a Wide Version. Versatile, lightweight off-road shoe with low-profile reverse buckles for secure fit. TORBAL midsole with glass-fiber reinforcement for natural rider flow and power transfer. Lightweight rubber outsole for all-conditions traction. Claimed weight: 381 grams (size 42). Stiffness level: 5 of 12. What I like I'm surprised how much I like these shoes. If I had seen them in person first, I might not have bought them because they look a bit flimsy. However, they seem to be quite impervious to the beatings I've given them so far. I'm surprised at how much I like the strap system. It works great and opposing the straps was s a stroke of genius. These shoes ride well and are very good in the hike-a-bike sections. What I don't like For me, the shoes could be wider in the toebox. I typically wear size 44. I ordered 45 for these shoes, but I would order 46 if I needed a new pair. On the positive side, they are tolerable, unlike a similar, highly-touted, high-volume shoe from a different company. What I don' know yet Durability. They look unscratched after a few months of riding, but I imagine most biking shoes would. My previous pair of Shimano biking shoes lasted over a decade, but I doubt that the two pairs of shoes had any designers, builders, or the decision-making executives in common. The first thing to notice (wish I had) is the middle velcro strap closes toward your instep. If your feet are at all narrow, and I'm thinking less than D width, the excess strap comes in contact with the crank arm and both makes noise and starts undoing itself while you pedal. Granted this is easily fixed with a pair of sharp scissors, but it just seems wrong for the user to have to cut a of Brand New pair of shoes to correct a factory design flaw. I bought these to be my first foray into the SPD world and for that they are acceptable. Some have remarked that the buckle and strap are flimsy, good news they are both replaceable, bad news I've yet to come across anyone who stocks these parts. I will not be buying another pair when these wear out and I would not recommend them to a friend. I bought these to try out SPDs (been a Look guy for ages) and as a try out shoe these are OK for the price. First, NARROW FEET be warned I have B width feet, notice the middle velcro strap fastens by pulling to the instep. When I pull this down enough to be effective the end of the strap often lifts up and scrapes again the crank arm. Often this will happen with both shoes. Not fatal but annoying just the same. Eventually I'll cut the excess, but taking scissors to a brand new shoe should not be necessary. Second, the cam buckle feels pretty thin, I don't really crank it down like I do with SIDIs and the like. Upside, it is replaceable. Don't ask me where to find the part though. Long story short they do the job, but I won't buy another pair. Needed some clipless for my mountain bike. Nice light shoe with durability. Simple design. Weak Buckle makes these a Poor Choice! My 14-year old son uses these for XC riding. After about a month of use one buckle cracked, rendering it unusable. I purchased new buckles but, as other reviewers have noted, the ratchets on the plastic straps wear quickly so you are unable to tighten fully, then they jam when trying to loosen them. My teenage son can't get his shoes off without help! The shoe bukle does not tighten as the strap teeth are striped out. The sole is falling apart. I have bought this model of shoe in previous years and it always held up well, until now. Poor shoe quality. Shoe started coming apart after a few months of riding. I bought these shoes less than 8 months ago and the rubber sole on them are cracking and coming apart from the sole. Also the buckle on the left shoe will not tighten with the micro adjustment lever. On the positive side, the shoe is fairly light and works well when you have to get off the bike and walk. Terrific shoe ..... 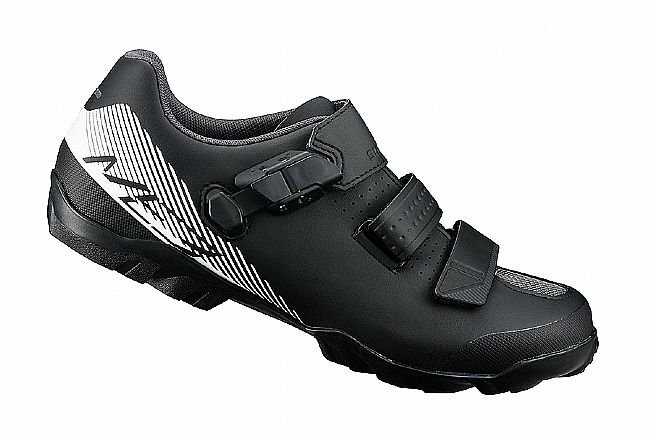 I have been wearing Sidis for 15 years and these compare well - maybe more comfortable. They were great value on sale. Only problem was with Bikes Direct who shipped them without the plates to attach cleats ... it took three tries, first time they only shipped one plate instead of two - hello! Mountian biking. Shoe fits to size. Hold foot secure while pedaling. I love my flats but i wanted to try clipless. I have a wide right foot and these shimanos have the wide shoe and btd had the price. Love these shoes enough room for a thicker sock to rixe the trails in the winter months. Use when touring on a Comotion tandem. Have about 500 miles on these. Excellent fit for my 10EE foot. Buckle very easy to use. Light and easy to walk in. Overall nice construction. Too high on front of ankle. Roomy bit lightweight socks make the inside too spacious. Love these wide shimano shoes. Even more love the price. I've never been so comfortable in a bike shoe as I have with these shoes. All other shoes I've had over the years were always a little tight on my feet and I don't really have wide feet. I figured I'd give these a shot and very happy I did. When I wear out this pair I'll be buying another. Fit perfect. Sizing was accurate as advertised. The Velcro and ratchet strap make it easy to adjust fit. Very comfortable. The clicker is mounted on a rubberized plastic strip which grips the plastic clicker strip, making it impossible to tighten the shoe past a certain point. Also having the Velcro strips facing in different directions is an annoyance. Nice shoe at a great price, but are sized small, and somewhat narrow, if you purchase order 1 size larger at least.